Nestled beside a lush forest, the TWIN CREEK COTTAGE is a cute cottage w/modern sophistication & comfort. Its in-town location is close to all area activities. Be spoiled by an awesome massage chair, huge hot tub, quality king, queen & twin beds w/sumptuous bedding, gas log fireplace, high speed wireless Internet, 4 flat screen HDTVs, DVD player, big DVD movie library, central heat/air, quality cookware & dishes, washer & dryer, fire pit for marshmallow roasts, kids playground, Playstation 2 with games, baby crib, high chair & stroller. Please check out my business at Asheville Vacation Homes for more details about my 11 vacation homes. I have been renting to Asheville travelers for over 14 years and am so grateful for my satisfied guests and great reviews. YOU are my full time business and I will do my best to see that you have a 5 star stay! This captivating 3 bedroom, 2 bath cottage is a 1 level home with an open concept kitchen/dining room/living room. The patio under the trees is perfect for outdoor dining & entertaining! INDULGE! You deserve to be spoiled at my vacation home! I am a caring local owner and answer all inquiries personally. I take exquisite care of my homes & am available anytime to see to your needs. 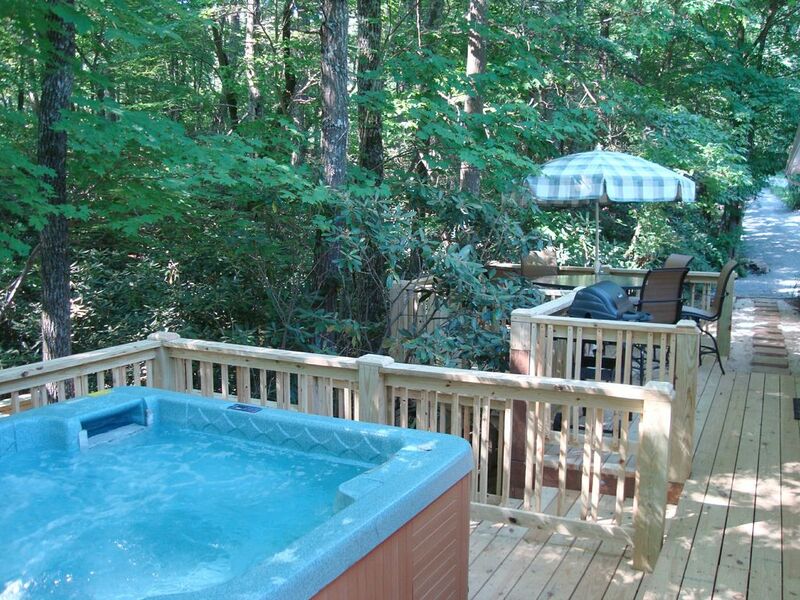 I make sure the home is exceptionally clean, well maintained & the hot tub sparkling w/fresh water. LOCATION: TWIN CREEK COTTAGE is conveniently located right in-town only 3 miles south of I-26 (Exit 44) with 20 minutes north to Asheville, 25 minutes to the Biltmore House & 5 minutes south to downtown historic Hendersonville Main Street shops & restaurants. (1) The MASTER KING SUITE has a quality plush king bed w/stylish comforter & sumptuous linens, HDTV w/DVD, 2 closets, delightful artwork & a private bathroom w/skylight & a combination tub/shower & plush towels. (2) The GUEST QUEEN BEDROOM has a plush queen bed, soft bedding, HDTV w/DVD, charming wall art & a woodlands window view. (3) The KIDS BEDROOM has a cheerful “Alice In Wonderland” mural, stuffed animals & toys, a full-size crib, a comfortable twin bed w/pull-out twin trundle & HDTV. For additional sleeping, there is a quick inflate-deflate twin air bed. Just outside the two guest bedrooms is a second bathroom with skylight & a combination tub/shower and soft towels. KITCHEN: This modern kitchen has ample cabinets, counters & a large pantry. It is fully equipped w/plenty of quality cooking equipment to please any chef! A delightful 8 foot mural “Café Romanique” depicting a quiet restaurant scene adds dramatic dimension to the room. LIVING ROOM: An ultra comfortable, chic sectional lounge, sofa & half circle swivel chair add a sophisticated touch to this designer room complete with an elegant gas log fireplace, massage chair, wood floors & a 40' HDTV w/built-in BluRayDVD & large DVD movie library. Have fun with the Playstation 2 with a dozen games. There is plenty of room to stretch out whether to relax, watch TV or visit with friends & family. Behind the sofa is plenty of room for our game table & chairs. DINING AREA: Adjoining the open kitchen and living room is the dining area with a spectacular oil painting. The room’s doors lead out to the 2 large decks (one for dining & one for huge hot tub) & magical stairway leading down to the forest canyon below with a bench to enjoy the quiet woodlands. FOR BABIES & CHILDREN; OUTSIDE LIVING: Always important guests at our homes, we provide plenty to keep kids entertained & enough baby equipment so parents can travel lightly. There is a full size crib w/bedding, pack-n-play, high chair, stroller, baby bath tub, cuddly animals & soft blankies. Outside is a playground w/fort, slide, climbing wall & swings. Inside, the kids’ bedroom has an “Alice in Wonderland” wall mural, stuffed animals, books, games & toys. OUTSIDE LIVING: Enjoy outdoor dining at the patio table & chairs, cook on the gas grill or go hot-tubing under the trees in the large 6 person deluxe hot tub. There’s even a surprise stairway winding down to the forest canyon with park bench & tiny stream. Enjoy a roast over the fire pit. Both bathrooms have great skylights providing wonderful natural light. The towels are plush and the rooms are delightfully decorated. Our bathrooms are ultra clean! The cottage is at 2200 feet above sea level in a mountain valley of the Blue Ridge Mountains. The home is just 4 miles to Hendersonville's historic Main Street with 10 blocks plus side streets of wonderful restaurants, galleries, antique stores and unique shops. You are at the edge of a beautiful woodlands & Rhododendron forest. View is of the lush forest. Oversized High Efficiency Maytag Washing Machine with no center agitator...much easier on your clothes! Large kitchen filled with quality cooking equipment to please any chef! Plenty of cupboard & counter space & pantry closet. Quality dinner ware as well as kids dishes. (4) Each bedroom and living room has a HDTV; 3 with built-in DVD player for easy use. Toys, stuffed animals, kids books, etc. A huge 6 person hot tub, lots of jets, 2 powerful massage pumps & air massage pump...always sanitized & filled with clean water when you arrive. The house had everything we needed. It was cozy and comfortable, review is excellent. Wish we could have stayed longer. Our kids could’ve stayed at the house for the entire weekend and been perfectly happy. With the hot tub, fire pit, playground, and beautiful surroundings to explore, our family had an excellent weekend away. We will definitely be back soon! Great home for a family vacation. Home is stocked with everything you need, toys, books, movies, games and lots of little extra's. We enjoyed the outdoor amenities and our little one loved exploring the creek. Everything in listing is accurate and as expected. Conveniently located to the highway, restaurants and hiking trails. 5-Star Rental!! Beautiful comfy cottage nestled in the mountains of NC, convenient to everything! This cottage is one of the best rentals we have ever stayed in! Communication with the owner was great! Because we arrived after dark, she had lights turned on for us, and we had no problem locating the address. Stephanie has great instructions about everything in the cottage, from operating the huge hot tub (with very strong jets) to how to adjust the heat. She also has a great list of where attractions and dining options are located. Everything in the cottage worked very well. The hot tub was spotless and worked perfectly! There is a short stairway and very short trail that leads to a bench beside a small creek. It is in the middle of the woods- awesome! The house is well supplied with everything we needed- even scissors and tape, which one hardly ever finds at a rental. Didn't need spices for cooking, even though I brought those too! Very close to Hendersonville - maybe 10 minutes. Sierra Nevada and Bold Rock Hard Cider are 10 minutes away in Mills River, and Asheville was a convenient 30 minute drive. The best of both worlds - you feel like you are in the forest, but in 10 minutes you can be at a Starbucks! We went to Tupelo Honey, the Pinball Museum in Asheville, New Belgium Brewery, the Flat Rock Playhouse, Sierra Nevada and a tour, the NC Arboretum, and Bold Rock Hard Cider. Then we came home, sat in the hot tub, and watched some good football! Great trip! Lots to do here! Thanks Stephanie for a great home for the weekend! This is my wife's and my third year in a row to stay in one of Stephanie's homes near Asheville. This is probably our favorite so far. In all of her houses there is a great deal of attention to detail and we have found everything that we could possibly want there upon arrival. They are spotless, very well furnished and more comfortable than any of the homes we have stayed in across America. My wife and I would recommend her homes without reservation! In WNC you'll find an eclectic group of people from movie stars to mountain folk. Our town & activities are as diverse as its residents. For outdoor enthusiasts there is hiking, mountain biking, canoeing, white water rafting, sightseeing, horseback riding, fishing, swimming, golf, miniature golf, rock climbing, snow skiing, zip line adventures & more!